The original town of Abbeyleix grew up near the River Nore, on the site of an early Christian abbey. The town developed under the protection of a twelfth century Cistercian monastery. In 1562, Queen Elizabeth granted the abbey and associated lands to Thomas, Earl of Ormond. Over the next century, the village grew to contain 52 families. However, regular flooding from the River Nore made the town an unhealthy place to live. When the de Vesci family acquired Abbeyleix in 1750, they decided that the town would have to move. The de Vescis levelled the old town of Abbeyleix and moved its people to a new planned town. 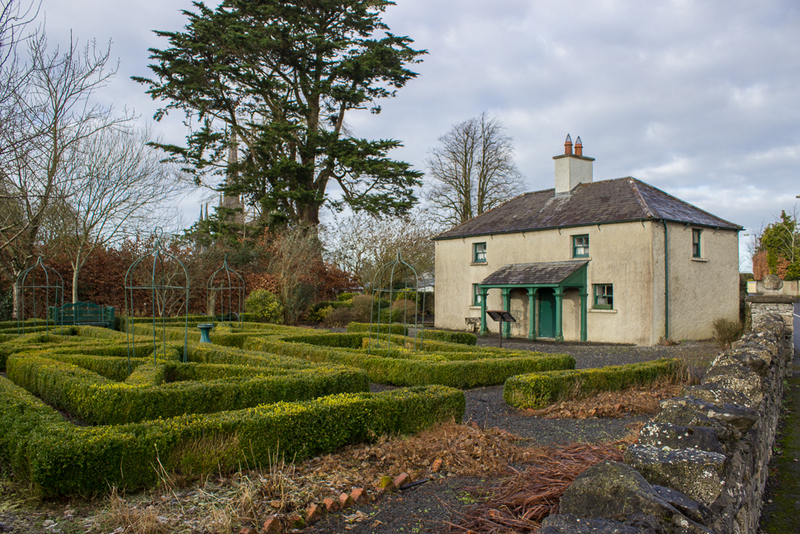 Abbeyleix prospered in its new location and by 1837, had grown to 140 houses. Local farmers traded at the Market House and business premises lined its crescent. Over the next century the main industries included flour mills, a brewery, and a factory that made carpets used all over the world, including on the luxury liner Titanic. Lady de Vesci looked after poor widows in the Alms House on Temperance Street. The destitute were admitted to the Workhouse, which opened in 1842. Today visitors can admire the fine period buildings that remain in Abbeyleix, including the Church of Ireland, Baptist Meeting House, Wesleyan Meeting house, and Catholic Church. Those wanting to learn more about life in the mid-1800s can visit the restored Sexton’s House (above). For the full story of the town, go to the excellent community-run Abbeyleix Heritage House Museum in the old North School. This clip is an introduction to a short film on the historic towns of Laois created by Abarta Heritage for Laois County Council as part of an Ireland’s Ancient East project, funded by Fáilte Ireland.